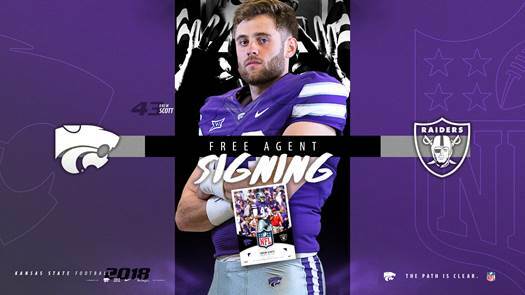 MANHATTAN, Kan. – Kansas State added another player to its rookie class of 2018 as Wildcat long snapper Drew Scott inked an undrafted rookie free agent contract with the Oakland Raiders, the organization has announced. Scott joins cornerback D.J. Reed, who was selected in the fifth round of the NFL Draft by the San Francisco 49ers, kicker Matthew McCrane (Arizona Cardinals free agent) and Byron Pringle (Kansas City Chiefs free agent) as players who have moved on to the NFL this year. A product of Cedar Rapids, Iowa, Scott will be joined in Oakland by two other former Wildcats in wide receiver Jordy Nelson and linebacker Emmanuel Lamur, who previously played for Green Bay and Minnesota, respectively, but joined the Raiders this offseason. Scott served as the primary long snapper in each of the final 26 games of his K-State career, while he saw action in 31 total games. As a senior in 2017, Scott was true on all 133 snap attempts, and he set a new career high with three tackles on punt coverage, including two against West Virginia. His three tackles on punt coverage tied for team-high honors. In addition to his work on the field, Scott was also a two-time Academic All-Big 12 selection.